The last two Five Nights At Freddy’s games were full of well-hidden Easter eggs, and the third game is no exception. 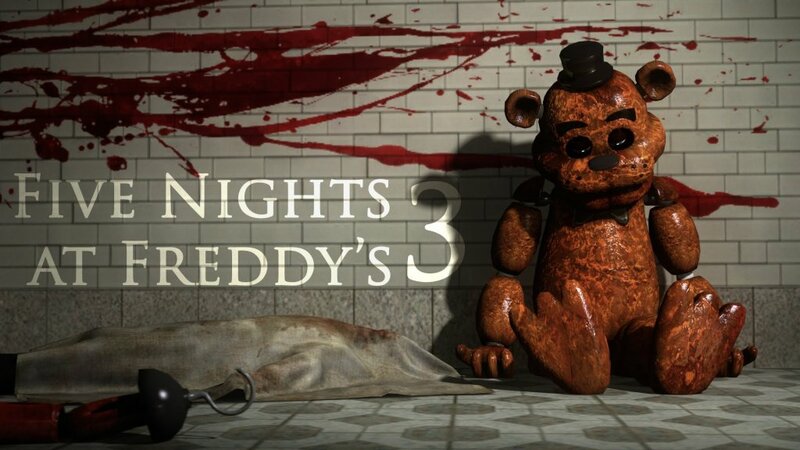 Five Nights At Freddy’s 3 contains not only an extensive list of Easter Eggs you’d have to be a god to uncover, but also has multiple endings. Reaching the good ending is no mean feat – you’ll have to complete all the bonus minigames, in order, without fail. Full credit for this guide goes to PrettyGrumpyBear. You don’t actually have to do anything on this night – just play through it like you normally would. It’s interesting to note that Springtrap isn’t actually present on the first night, nor are any of the phantom animatronics. It’s there to get the player acquainted with the new location, so you can sit back and relax through this one. Switch to camera 8. You’ll see some posters on the wall on the left, one of which depicts Balloon Boy. Click on him to start the first minigame. Collect all of the balloons, but when the exit door appears do not go through it. Jump to the top right corner of the minigame and you’ll be able to move through the wall. Then you’ll fall through some weird-looking screens. When you stop falling, move right. Ignore the weird stuff you’ll see here and you’ll reach the last balloon. That ends the first minigame. You’ll now be back in night 2. Switch to camera 7 and look for the arcade machine in the static. You’ll see four buttons on the left side (look closely). Click them in this order: top-left, bottom-left, top-right, bottom-right. You’ll now be in a minigame called “Mangle’s Quest”, in which you’ll play as Mangle collecting all the pieces of his body. Creepy, yes. Make sure you don’t let the child touch you, or you’ll lose and have to start this whole process over again. It’s worth noting that Mangle’s original purpose was to be a toy that kids could pull apart, which is probably why touching the child means death for him. Collect all your limbs, ignore the exit door again, and jump through the top-right wall. You’ll fall again, and when you reach the bottom you’ll need to move left. Jump up the balloon platforms, and when you reach the cake at the top the minigame will end. Now go back to Balloon Boy’s minigame (the same way as before). Once you’ve got the balloons, jump out the top left like you did last time. You’ll fall onto more balloon platforms. Move right until you reach a platform with a crying child. As you approach, you’ll give the child some cake. This “saves” the child. Now go back and survive night 2. The next minigame is Chica’s. To enter it, you need to collect four skulls. They are located on the floor in camera 2, 3, and 4, and on the arcade machine in camera 6. In the minigame, Chica’s Party move right to the second screen. You don’t need to collect the cakes. Just drop down the hole to the room below. In that room, hop to the top left hand side, again through the wall, and you’ll find another crying child. “Save” them by approaching to give them some cake. Go back and survive night 3, but pay attention to the minigame at the end. There’s a code you’ll need – 395248. This is where it starts to get ridiculously convoluted. In your office, notice the tiles on the wall below the window in your office. There’s a set of nine tiles (3 by 3) between the box of junk and the bin, directly in front of you. Imagine those tiles as a number pad, like you’d find on a phone, with the top left number being 1 and the bottom right being 9. Key in the code from the last minigame to start Golden Freddy’s minigame. Move to the right and drop off the edge, but just as you fall, try to move left. This will appear to cause your character to glitch, but just let it go. Move left to fall, and you’ll land in what looks like a duplicate of the last room. Now move two rooms to the right. This should lead you to the exact same room, only now it has an exit door. Ignore the exit door. It gets tricky. Stand to the left of the bottom-left corner of the border, jump up, and again your character will glitch. Just before your character leaves the screen, jump left, and your character will be in the room to the left. Just as you enter that room, jump again and try to get on top of the border. This can be tricky, but you should be able to keep trying if you fall. Once you’re there, walk left until you’re directly above Sprintrap. Now jump up, and you should glitch into the room above. Land yourself on the ledge with Springtrap and walk past the children to the right wall. Jump, and you should glitch upwards again to above the border (honestly, it’s a miracle anybody was able to work this out). Stand directly above Springtrap and repeat the last step, only in this next room you’ll have to jump along the left wall instead of the right wall. Once you’re on top, jump off the right of the room and you should land in a new room with a crying child. Approach the child to “save” them with cake. Notice, as this minigame starts, that Golden Freddy is standing with Springtrap. This indicates that Goldren Freddy and Springtrap were the original two animatronics, both of them being hybrid suits. There will be a Shadow Bonnie plushie on your desk. Click it, and you will enter the next minigame. It looks just like the last one, only now Shadow Bonnie has joined the fun. Press S a few times until you get to Balloon Boy’s minigame (Shadow Bonnie will appear to glitch like crazy). In Balloon Boy’s minigame, jump through the top left wall like you did previously and fall to the bottom of the room. Press S some more until you see a crying child. Give them cake to “save” them. This will send you back to night 5. The last hidden minigame is reached through camera 3. Click on the picture of the marionette on the right to get to the Happiest Day minigame. Move right until you reach the room with greyscale kids – these are the kids you’ve saved. Approach the one on the right and he’ll get a mask. The children will disappear, leaving only their creepy little masks, and the minigame will be finished. Now go back and survive night 5. The good ending isn’t actually that different from the bad one, but you do get a slightly different end screen… so there’s that, I guess.